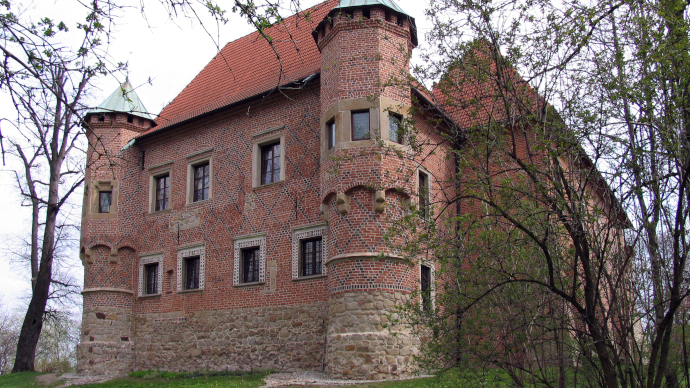 The Castle in Dębno is the only preserved in Małopolska historical building of magnate and residential architecture, erected at the end of the 15th century in the place of earlier buildings dating back to the 13th and 14th centuries, founded by Jakub Dębiński of the Odrowąż coat of arms, the Castellan of Cracow, the Chancellor of Poland. As the only preserved magnate seat of 1480, it amazes with its modernity in comparison with the then modern secular architecture. It has excellently preserved elements of architectural decorations made of stone (portals, window frames, decorations of bay windows). It comprises 4 buildings concentrated around a trapezoidal courtyard, covered with hipped roofs.